They require a large amount of consumables. To overcome these limitations, SynVivo have developed a microfluidic model of the Blood–Brain Barrier (SynVivo-BBB). The SynVivo-BBB platform permits the real-time visualization of both apical (cultured with endothelial cells) and basolateral side (cultured with neuronal cells) of the BBB mimicking the physiological shear and cell conditions observed in vivo. Shown here are astrocytes cultured in the SynVivo-BBB device. As a demonstration of the BBB assay, rat brain endothelial cells were cultured in SynVivo-BBB under physiological conditions. Permeation studies and western blot analysis showed formation of tight junction molecules while transporter assays indicate a modulating and functional model of the BBB. 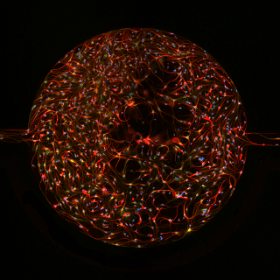 Full details can be found in the Lab-on-Chip journal paper: SyM-BBB: A Microfluidic Blood Brain Barrier Model.